Uh; most of us "Irish" came to the US LEGALLY. Those of us who were fools got killed or at least tossed in jail and MANY of us paid for being stupid and drunk. You gotta understand we pretty much changed from the "Shanty Irish" to the "Lace Curtain Irish" starting about 100 years ago with JFK busting out our LAST glass ceiling to the top in the US in 1960. Um, one of the posters did suggest that we make Cinco de Mayo a national holiday to honor the newly amnestied illegals and show our solidarity with them. 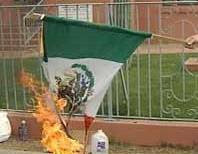 The difference between Cinco de Mayo and St. Patrick's day is that the former celebrates a war won and fought by Mexico. It is not a part of OUR history. The latter does not. There is nothing we can do about the Reagan amnesty it is over and done with and it was a mistake and it matters not to me that he was a Republican or a Democrat. There is something we can still do about this latest amnesty proposal. We can stop it in its tracks. It isn't too late. I don't care if it is Obama or the Republicans that are proposing it. It is wrong either way. Any Repbublican who supports it will gain my wrath. You can enter Mexico, and stay in the border region, without ever needing to show documents. Only the interior (and there are areas, like Baja California, that are excluded from needing permits) requires a foreigner to have an FMM. Why are you talking about "sneaking in" when you can go into the interior for a week cost-free, and have no other document than the FMM? False, especially from Mexico. The rejection rate is probably about 95% for the B2 (visit for pleasure, which is the "Tourist Visa"), because the adjudicators suspect it more than a B1 (visit for business) or Border Crossing Card. You need to show proof of property ownership you will not abandon in Mexico, and fare for your return. ...The illegals here aren't coming here to visit and spend their tourist money. They are coming here to take jobs and benefits. While here, they have baby after baby at our expense which then qualifies them for all means-tested benefits. This is a 100% a different scenario than the one you are putting forth. Different or not they still do not have 11 milion plus illegals liviing in their country so they must be doing something right. Why do I get the feeling that Oldglory's assumptions about Mexicans coming here and having 10 kids is out of date by at least 20 years? They did all those jobs for their own economic gain and did it while being here illegally and cutting honest Americans out of jobs or reducing their wages and for this they deserve the gold medal? Not in my book they don't. I don't care if an illegal is from Europe or Mexico they need to go home not amnestied. Just about everybody hires illegals? Where are you getting that? Justice is making them leave and go back home. That's justice for law abiding, honest American of whom make up the majority in this country.